Delhi Capitals won by 37 runs as MI suffered a defeat at home. IPL 2019: Mumbai Indians is not only one of the most successful franchises, but it also enjoys one of the biggest fan bases. The Mumbai Indians franchise owned by the Neeta Ambani-owned Reliance Group and she is one of the best when it comes to interacting with the players in order to create a good bonding among the players. 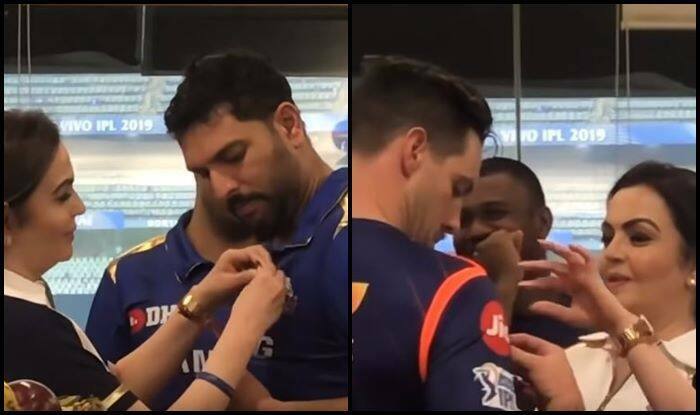 The franchise also has a lot of team traditions they have been following for years, one of them is to present two badges to cricketers from Mumbai Indians who were good on the day. You may not have scored the highest runs or bagged the most number of wickets, yet you may win it for your effort and commitment. The MI may have not won the match against Delhi Capitals, but new-recruit Yuvraj Singh was given the badge of honour and the other player to receive it was Mitchell McClenaghan. Yuvraj Singh playing his first match for Mumbai scored a 35-ball 53, whereas McClenaghan picked up three wickets with the ball. “First game is always challenging for most of the teams because there are a lot of new players in the squad. We made a lot of mistakes today and that was the reason we lost the match. We were in the game in the first 10 overs while bowling but the way Rishabh batted, we have to give the credit to him. We missed our lengths and failed to execute our plans but that can happen as there are a lot of new guys in the squad and understanding takes a bit of time. But having said that we are all professional cricketers and we need to learn from our mistake as quickly as possible. We had 6 bowling options today,” said Rohit at the post-match presentation.